The World Academy of Art and Science was established in 1960 as a non-official network of individual Fellows from diverse cultures, nationalities, and intellectual disciplines, "chosen for eminence in art, the natural and social sciences, and the humanities. Its activities focus on "the social consequences and policy implications of knowledge." The Academy serves as a forum for reflective scientists, artists, and scholars to discuss the vital problems of humankind independent of political boundaries or limits, whether spiritual or physical -- a forum where these problems can be discussed objectively, scientifically, globally, and free from vested interests or regional attachments. Over the past 20 years, MSS has collaborated with WAAS on a number of international conferences and research projects on issues related to development theory, peace and global security, employment and the future of science. Click here for a complete list of joint conferences. 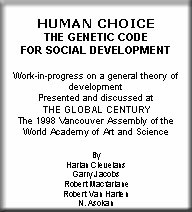 by Harlan Cleveland, Garry Jacobs, Robert Macfarlane, Robert van Harten, Ashok Natrajan Social development is the product of the application of the powers of mind to organize the physical materials, social activities and mental ideas of humanity to achieve greater material, social, mental and spiritual experience. Whether we look backward or forward, we face the same puzzling questions: What is the essential nature of human development? By what process does it occur? What factors speed it up and slow it down? What conditions are essential or detrimental to it? Through what stages or phases does it pass? What are the sources of its problems and its failures? And, probably most important, what is the role of the individual human being in human development? The approach outlined in this book gives central importance to the role of organization in development, organization as defined in the widest sense as the orderly arrangement of human activities to achieve greater productivity, efficiency, innovation and creativity. Eliminating Nuclear Weapons | PDF File, Presented at a WAAS workshop during the World Futures Society annual conference in Toronto, July 2006. Theory of Social Development presented by Robert Macfarlane at World Academy conference on Development Theory in Chennai 1999.